Now that the dual core MTK6577 processor is mainstream in most Chinese made phones, how does it compare with branded phones on the market. Here, we look at three phones and their Antutu Benchmark and compare the scores. The closest phone in terms of performance is the Sony Xperia P so we will use this phone scores for comparison with out MTK6577 phones. If you look at the first 3 items on the list: RAM, CPU integer and CPU floating point, you see that all are similar in performance. 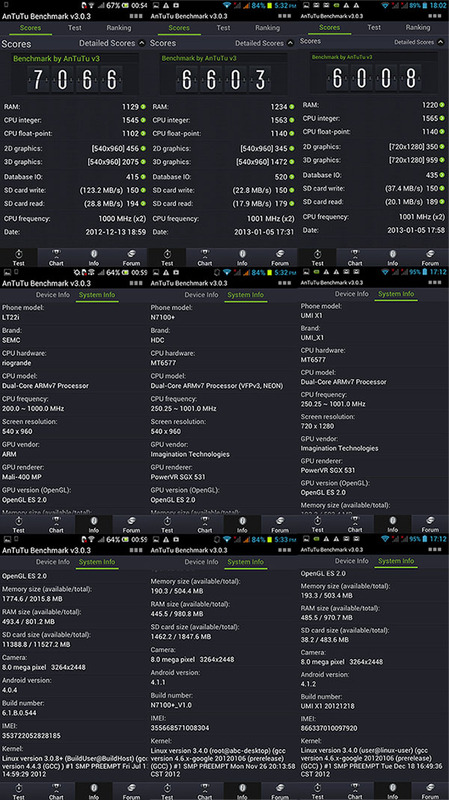 The Sony Xperia P uses a NovaThor U8500 1ghz dual core processor and the numbers vary just a little, so we can say that the MTK6577 and the Novathor U8500 are equal in performance (although the pics show the MTK6577 having marginal lead). The RAM speed on the 2 Chinese phones are actually faster. This may be due to the DDR3 RAM being used. When it comes to 2D and 3D graphics, the Xperia P pulls ahead due to it's superior Mali 400 GPU. The difference in speed is roughly 25% faster than the dated SGX531. It shows the Xperia P having a Mali 400 MP GPU but my research indicates that the Mali 400mp is actually a single core GPU running at 340 mhz used here. The UMI X1 lags behind because it is the only phone with HD 720 resolution so the GPU has more pixels to push but the scores of the UMI X1 are respectable. This is the real way to read the Antutu benchmark and not just look at the full score. The MTK6577 is indeed positioned as mid range with performance close to that of the mid range Sony Xperia P. I have used the Xperia P and did not find and performance difference in normal usage. In fact the MTK6577 phones appear smoother due to Jelly Bean. We now await the arrival of the quad core MTK6589 phones arriving soon. Production should be in full swing in March with many phones releasing in quantity in April. The haipai generally should have good cameras and probably nice HD screen with jelly bean. It is not to my preference as I think HD screen will not be as fluid as qhd screen and also the 512mb of RAM. It may be good for you. Just my preference. Hi Greg and thanks for the best reviews that you have here! I have order a phone not from Pandawill or Fastcardtech a chinese phone because its cheap and may be good but I cant find a good reaview like yours! This phone is a JiaYu G2S and has MTK6577T at 1.2Ghz Dual core GPU PowerVR 531 Ultra with 1GB Ram 4inch qhd 960x540. I didnt know that iphone use the PowerVR 5XX for their phones and i think the cpu says that is Apples something is at low Ghz may its MTK. The jiayu g2s is a very good phone. The mtk6577 T version really runs at 1.2ghz. 540x960 is already very sharp for a 4 inch or 4.3 inch phone. The CPU/gpu combo can run 720 HD screen but not at full speed. 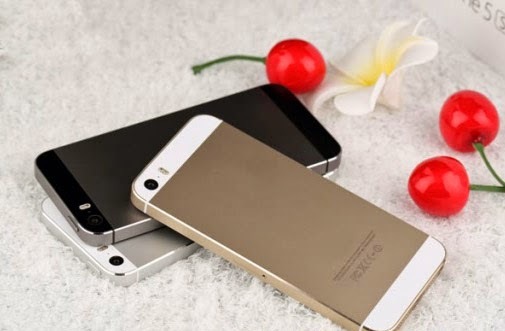 The iPhone has the more powerful newer generation PowerVr GPU chip.